Did you know a keyboard can contain more germs than your toilet seat? 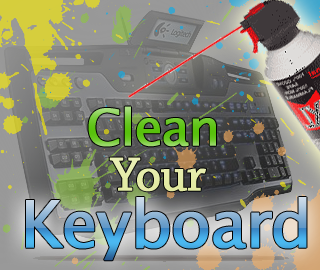 That is why research shows you should regularly clean your keyboard to remove the dust and clutter that attracts germs. Disconnect your keyboard from your computer. After the keyboard is disconnected, grab your can of compressed air and turn it over. Now, tap or lightly shake your keyboard… Look at all that grime and dust fall out! You may repeat this step if there still appears to be more. Now grab a cotton swab and dip one end into the alcohol and swoosh it around the sides of the keys. You can also scrub the top of the keys too. Note: You can remove all the keys of the keyboard (using the sides of the keys), and wipe them with a moist towel for more thorough cleaning. Never ever put anything containing liquid directly on your keyboard; you risk breaking it. Now after all that work, go relax. Drink a Mocha!